Scott Brown, historic racer (Group 3A winner at the 2010 "Sonoma Historic Motorsports Festival" in his 1957 MGA) contributed photo and info on Ed Lamantia's Genie-Corvair. "This photo shows Ed Lamantia Senior (31 MGA - Ed Jr's. father) in his newly purchased ex-Jerry Titus Huffaker Genie. This is the only Corvair-powered Genie Joe Senior built. Ed Jr. discovered his father's old car in Washington 2 years ago and it's now being restored by none other than Joe Huffaker Senior. 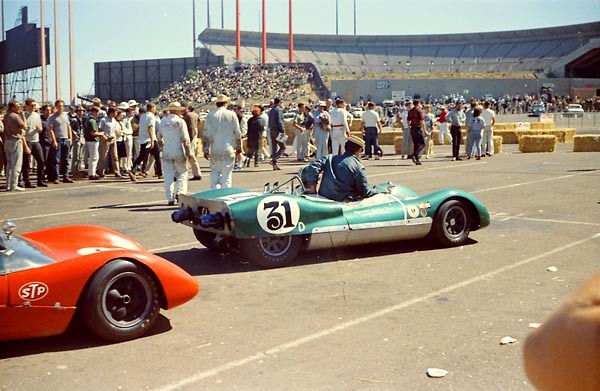 In this photo is Ed going to grid for the SCCA race at Candlestick Park. Will confirm a date for you."